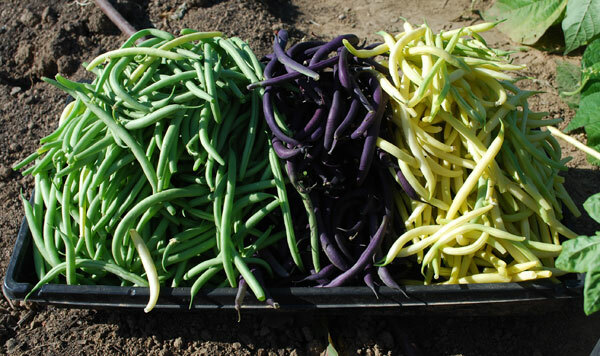 Green bean varieties come in bush and pole types. 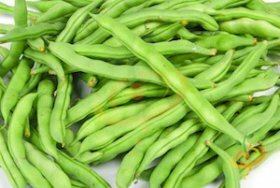 Both bush and pole beans have dozens of cultivars, from broad, meaty Roma types to thin and delicate French filet beans (haricorts verts). Pods can be round or flat, and come in multiple colors: green, purple, yellow, or mottled. 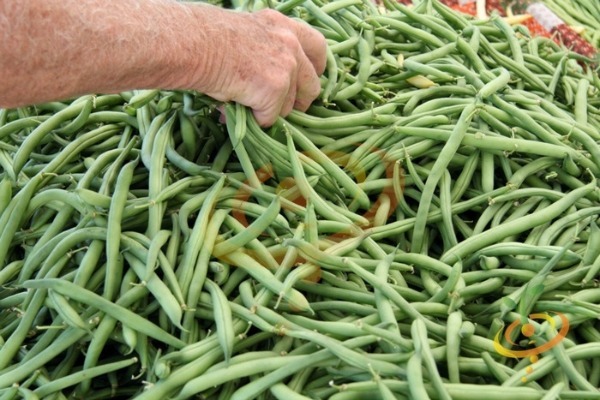 For information on Growing Green Beans, click Here. 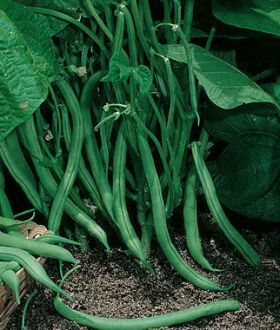 Bush green bean varieties grow to about 2 feet (60 cm) tall. When properly spaced, the plants grow together and support each other, and need no trellising. 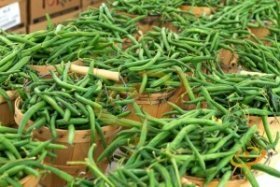 They come in a week or two earlier than pole beans, but produce fewer green beans. ‘Jade’ (60 days, BMV) produces very straight, dark-green round pods on vigorous plants. Produces later in the season than many bush varieties. Resistant to bean mosaic virus. Light green seeds. ‘Maxibel’ (50 days) is a dark green filet bean. Produces slender, 7” (18 cm) stringless pods. (“Stringless”—meaning they develop strings later rather than sooner). 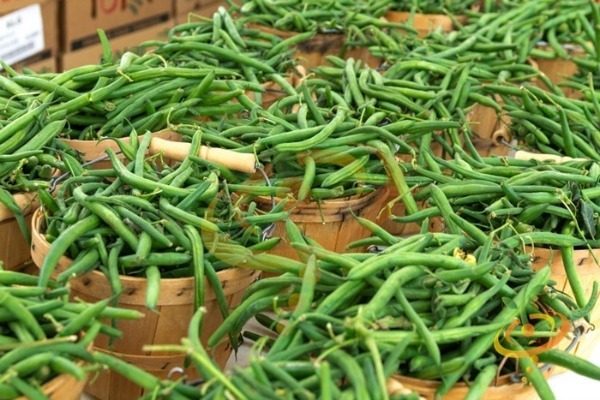 Pick every couple days to avoid tough beans. Mottled brown seeds. 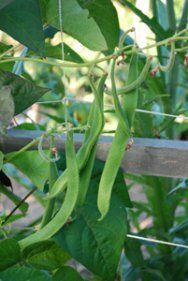 ‘Contender’ (50-55 days) is one of the best bush beans for cool- or- short-summer gardens, where other varieties perform poorly. Produces flavorful, slightly curved pods 6-8" (15-20 cm) long that are excellent for eating fresh, freezing, canning, or pickling. 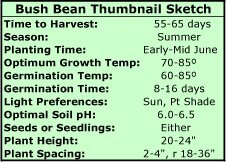 ‘Provider’ (50 days) is a compact early bush bean that produces 5 1/2" (14 cm), slender, stringless beans. Seeds can germinate in cooler soils, unlike many beans, and plants produce well even in cooler weather. 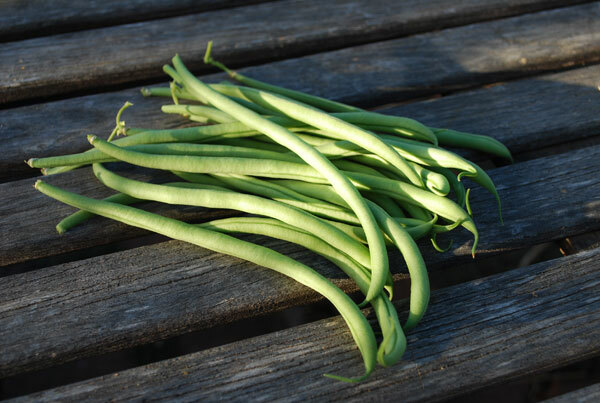 ‘Rolande’ (50 days) is a fine green filet bean that produces slender, 7” (18 cm) stringless pods, similar to ‘Maxibel’. Stays tender at larger diameters than ‘Maxibel’. 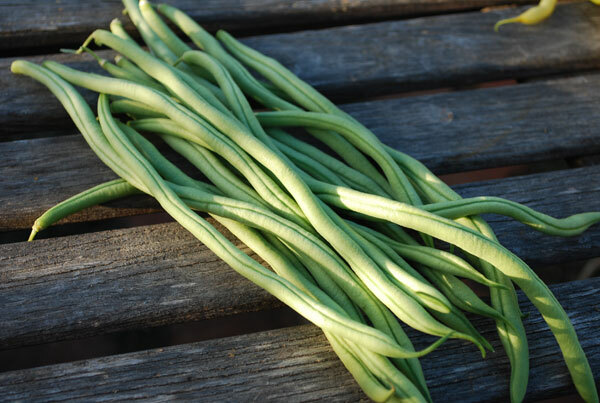 ‘Blue Lake’ (50-55 days) is a classic summer bush bean that's been grown for generations. Long, stringless pods with deep, rich color. 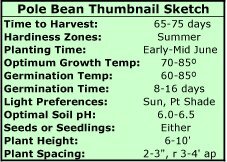 Beans mature all at once which makes harvesting easier. 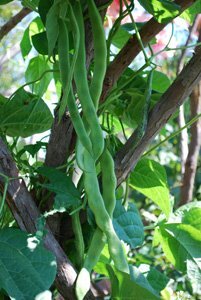 ‘Tendergreen’ (55 days) bush beans are the best variety for hot-summer gardens, with superior performance through hot weather. Disease resistant and adaptable to multiple zones. Outstanding flavor, stringless pods. ‘Dragon Tongue’ (OP, 60 days) produces pale yellow pods with mottled purple streaks on tall (24-30”--60-76 cm), vigorous plants. 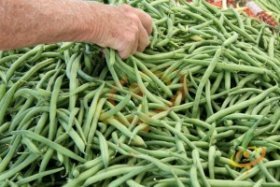 Versatile all-around bean that can be harvested young for green beans, or allowed to mature for shelling beans. Brown, mottled seeds. 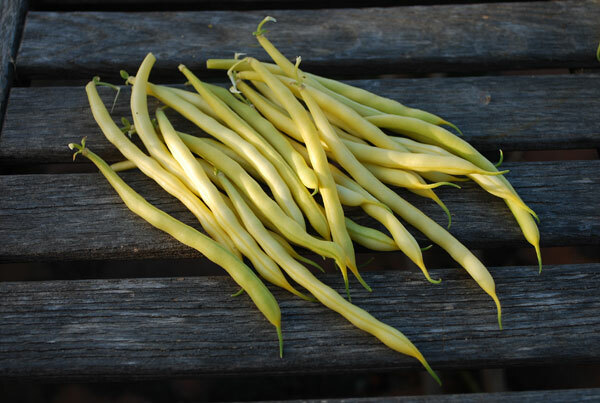 ‘Soleil’ (OP, 60 days) produces beautiful, uniformly slender filet-style beans, but with a gorgeous yellow color and great flavor. White seeds. 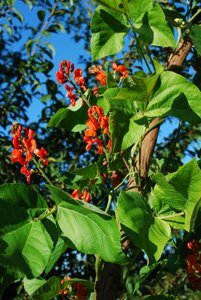 Pole bean varieties can grow 8-10 feet (2.5-3 m), and need a trellis or something to climb on for support. 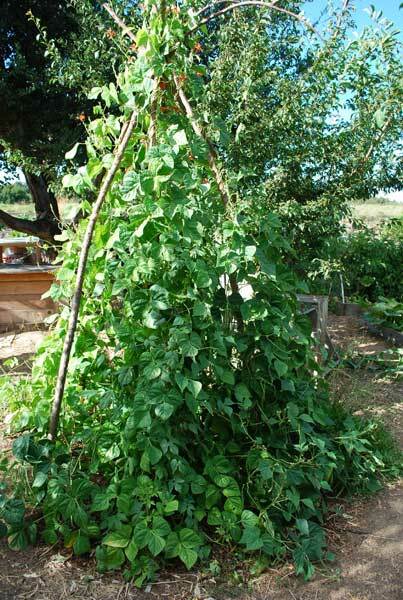 They’re called “pole beans” because one popular way to grow them is in “teepees” made of bamboo poles or branches. 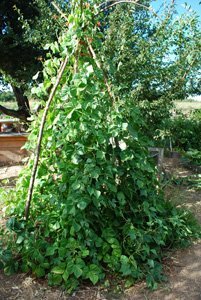 Here, I use windfall redwood branches to make a bean teepee. Pole beans take longer to start producing than bush beans, but they produce for a longer period and tend to be more flavorful. 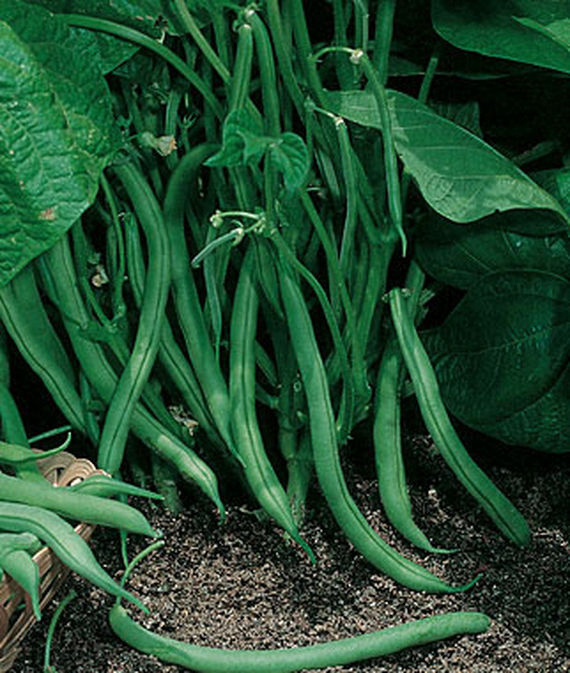 If you love green beans and have the space, plant both bush and pole beans, a few of each. 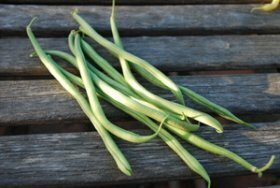 The bush beans will come in earlier in the summer, and the pole beans will keep producing after the bush beans are done. 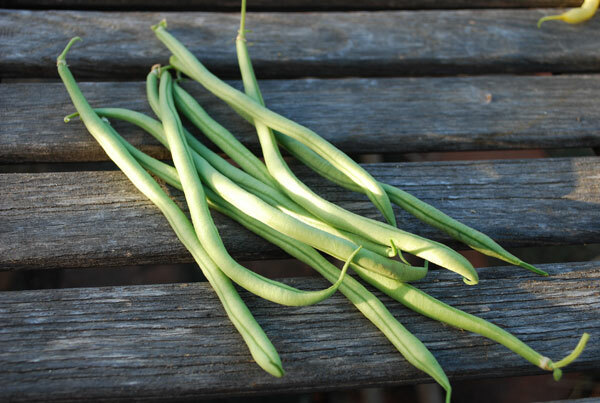 They’re also easier to harvest, because the beans are within reach—less stooping, bending, and squatting. 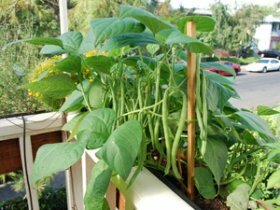 And given that harvesting is the biggest chore when growing green beans, setting up a trellis at the beginning of the season is a good investment, if you have the space. 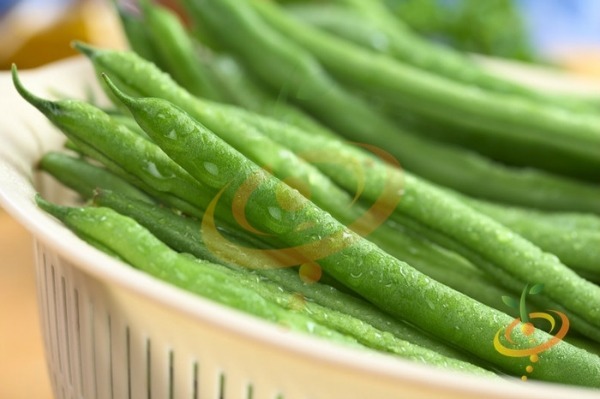 'Spanish Musica' a.k.a., ‘Spanish Miralda’ (75 days) produces high yields of large, flat roma-type green beans on vigorous, 6-10 feet (2-3 m) vines. Optimal harvest at 8” (20 cm), but pods stay tender up to 10” (25 cm). A client favorite for over 15 years. White seeds. 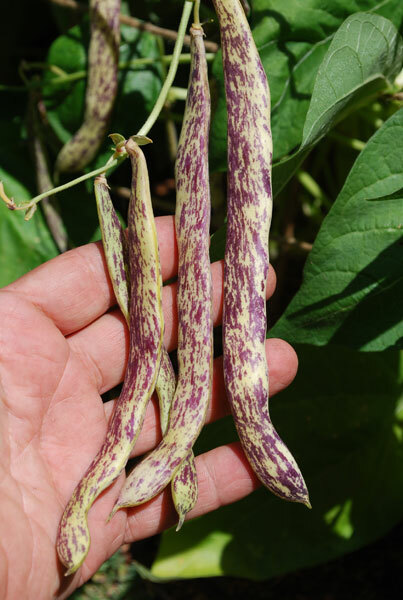 'Trionfo Violetta' is an Italian heirloom pole bean with beautiful purple pods, purple-veined leaves, and violet flowers. The large purple pods are easy to see, making harvesting easier. 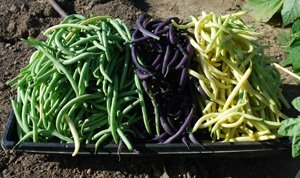 ‘Rattlesnake’ (70-80 days) produces 7” (18 cm) round, green pods, streaked with purple—similar to ‘Dragon Tongue’ bush beans. Vigorous, 8-foot (2.5 m) vines. Mottled, light brown seeds. ‘Fortex’ (OP, 60 days, A, BMV) produces early, high yields of extra-long pods—the longest pods of the pole beans. 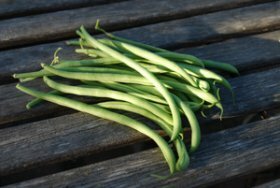 Harvest at 7” (18 cm) for slender, filet-type green beans, or harvest larger beans up to 11” (28 cm) long. Stringless and tender even after seeds have started to swell. Dark brown seeds. 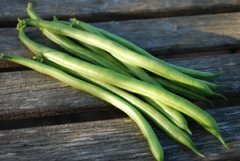 'Kentucky Wonder' is an American classic, an heirloom pole bean that's been grown for generations, and with good reason: The vines are prolific and disease resistant, and produce loads of deep green, round, delicious pods that are great for fresh eating, canning, pickling, or freezing. Runner Beans are the ancestors of modern green bean varieties. They tend to be large, vigorous climbers that produce big pods, and large beans if grown to maturity. Runner bean vines can run 10-12 feet (3-4 m), so like pole beans, they'll need a trellis or structure to climb on. They have large clusters of gorgeous scarlet flowers that will have hummingbirds and bumblebees zipping in and out of your garden all summer. The pods have a rough surface texture that disappears when they're cooked, and they have wonderful flavor. 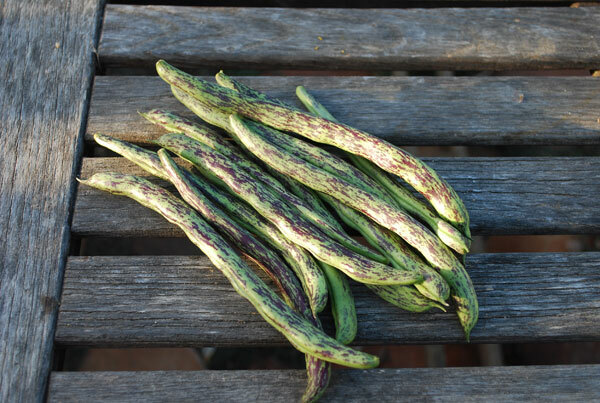 Harvest runner beans at 8-10" (20-25 cm). Yard long beans are the absurdly long bean you often see in Chinese markets. These vigorous, subtropical Asian varieties need long, hot summers—and hot summer nights!—to perform well. They also need a 10-foot (2.3 m) trellis or wall to climb on. Not worth trying in short-summer areas, unless started early and grown in a sheltered, warm microclimate, like along a south-facing wall. Black seeds. ‘Gita’ (78 days) has 16-20” (41-51 cm) long, green pods as thin as a pencil. 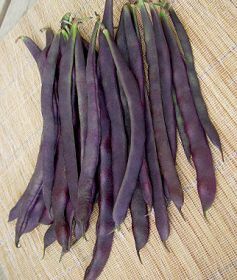 ‘Red Noodle’ (85 days) is similar to ‘Gita’, but with deep purple pods (color fades when cooked). Red seeds.